About ten years ago I did some consulting work for the Lawrence Livermore National Laboratory to help develop a cutter for use in cutting and testing stored solid explosives. One of the reasons I was selected was my background working with and testing advanced metal treatments such as cryo-treating, ceramic, and other vapor deposited coatings. The result of that work and testing was a hard material cutter which cut up to three times longer than untreated samples. While working with a meat processor and a number of paper manufacturers, this initial research confirmed itself over and over with longer wear and tool life, lower cost, and higher retained tolerances. I have seen the testing proof first hand and am a believer that advanced metal coatings and treatments dramatically increase service life and overall performance. This background was the reason I was very excited with what UCT Coatings has done with their EXO coating and FailZero subsidiary company. Where UCT Coatings is the applicator of the patented EXO Nickel Boron coating process, FailZero is the productized application of that process to a set of premium firearm products such as the FailZero M16/4 Basic Full Auto Bolt and Carrier Group Kit I am reviewing here, as well as coatings for a variety of firearms. After a sizable amount of customers coating their AR/M4 bolts and even an independent government test, UCT thought it was time to launch FailZero to provide a drop in bolt and hammer AR15 and M16 kits for the masses. The result is the finest quality AR bolt I have ever used, seen or handled. FailZero offers two mil-spec bolt carrier group kits which also include EXO coated hammers, one with an AR15 bolt and hammer and one with an M16 full auto bolt and hammer. 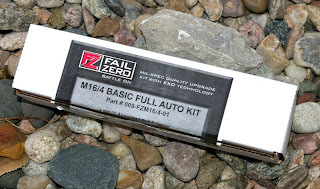 I purchased a FailZero M16/4 Basic Full Auto Kit because I am one of those who believe the additional mass of the M16 bolt marginally increases reliability over a wider variety of loads during longer periods between cleanings. Purchasing the M16 version was a carrier mass thing for me, but obviously you need a NFA licensed select fire M16 for full auto capability otherwise it performs like a standard semi-auto bolt. The kit includes an EXO coated hammer as well. A little bolt/carrier bling on your AR is great however only where it is secondary to function and I am not entirely convinced chrome is the substantial reliability upgrade people make it out as. Upgraded chrome coated bolts have proven themselves to provide some cleaning and cleaner running advantages which can increase reliability. The downside is I have also seen chrome bolts chip, peel and flake off, which not only looks like hell, but those rough spots can be more detrimental to reliability at that point than just starting with a plain bolt. EXO nickel boron coating is the improvement most people hope for when looking for bolt and carrier group upgrades. Like chrome, EXO does provide rust and corrosion protection, however to a much more significant degree. The UCT EXO coating on the FailZero M16/4 Bolt Carrier Group and Trigger Basic Kit is also significantly different in a number of ways. EXO coating is 40% harder than chrome, bonds at a molecular level to the metal, never rubs off, chips, thins or builds up. EXO also coats non-line of sight surfaces which mean inside all the holes, nooks and crevices. Of course the biggest advantage of all is that the EXO coating completely eliminates the need for lubrication. Someone once told me that the quality of the final finish is determined before any paint is applied, and with next generation coatings such as on the FailZero EXO coating prefinish is even more important. 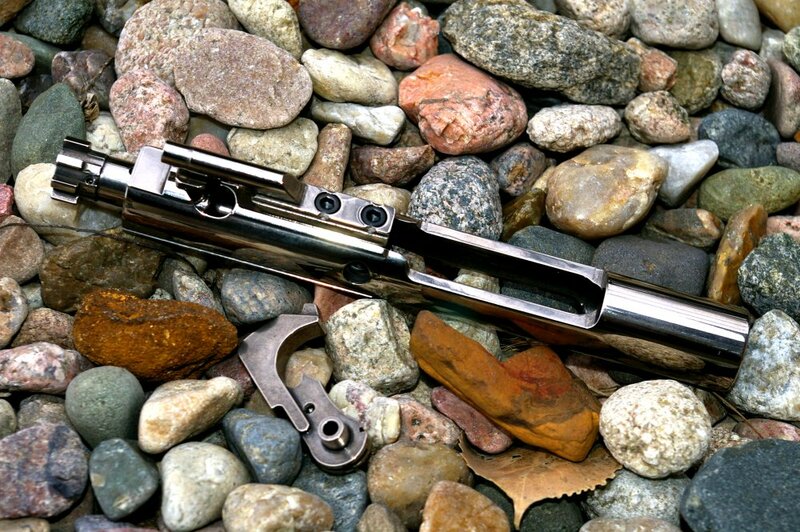 With that in mind FailZero obviously performs a significant amount of polishing before the application because post conversion of a Carpenter 158 Bolt and 8620 Steel Carrier into a FailZero Bolt Carrier Group (BCG) delivers a mirror polished stainless steel look. It is a truly the most stunning looking bolt and carrier you will ever put your hands on. It is important to note FailZero does this not to make a jewelry quality looking BCG to look cool, they do it because a polished finish is more slippery, easier to clean, quieter, better functioning and once the EXO coating is applied all those qualities improve exponentially on top of being able to run lube free. The hammer in the FailZero M16/4 Bolt Carrier Group and Trigger Basic Kit is also another part which takes an obvious beating and benefits from the EXO coating with easier cleaning, cleaner running, and improved reliability. When you handle the FailZero M16/4 Bolt Carrier Group and Trigger Basic Kit all the parts are of course dry but feel as though they are fully oiled... an odd feeling, but a great characteristic for lube free operation. 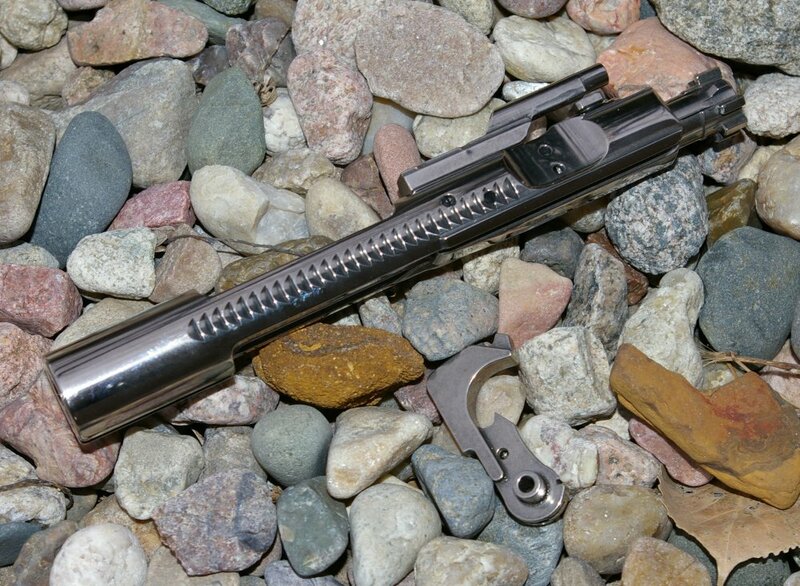 The most significant advantage of the FailZero M16/4 Bolt Carrier Group and Trigger Basic Kit is that the EXO coating is so slick it completely eliminates the need for any lubrication. The ability to run un-lubricated can be a significant advantage in sandy and dirty environments where particles like to latch onto lube and gum things up. Because the FailZero EXO finish is so slick it is also very easy to clean when compared to a standard phosphated bolt and carrier group and in my tests everything just wiped right off. The finish is so durable your can still scrape areas if needed. Less crud sticks and what does stick comes off and cleans up much more easily. 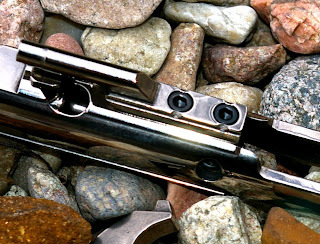 The BCG may get all the attention, however the hammer provided a very smooth and upgraded trigger feel from a standard hammer and even after a couple hundred rounds. It also looked like new after my testing which I think is an impressive testament to the durability of the EXO coating. I ran several hundred rounds with the bolt carrier group in a number of different rifles including my Del-Ton, Spikes Tactical, Black Rain Ordnance, and DPMS AR15s and it was a perfectly functioning BCG. 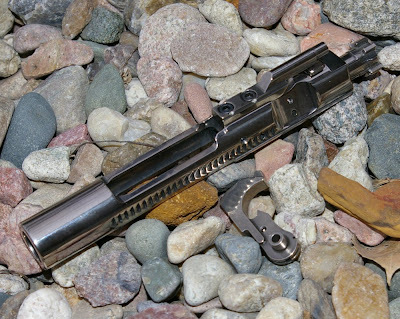 The reality is that the FailZero M16/4 Bolt Carrier Group and Trigger Basic Kit is not designed for a couple hundred rounds, it is designed for tens of thousands of rounds. The US Defense Department did several tests which validated and proved the FailZero bolt was effective for 50,000 lube free rounds and also tested it against a standard BCG in a variety of situations. I would have loved to repeat these tests on another person’s ammo budget, but I was not willing to drop $10K on ammo for this article. If you are interested, you can find one of the test articles here. The EXO coating is not voodoo, not a posers part, not just a pretty face, and certainly not just for show. This is a serious part for extreme hard use environments which also happens by its benefits to look great and is without question an upgrade for the most failure prone part on an AR. The Defense Department is sold on the EXO coating as well as many law enforcement and special operations units. The reason is simple, the FailZero bolt, hammer and carrier kit requires no lube at all and that increases reliability beyond a standard phosphated bolt, beyond a chrome bolt, and even beyond even a standard nickel boron coated bolt without the attention to prefinish that UCT undertakes. If you are looking for the finest looking ultra-bling BCG that could be in a modern art museum then the FailZero is your BCG. On the other hand if you are looking for the finest quality BCG that will outperform any other, you might seriously consider the FailZero Bolt Carrier Group and trigger kit.